In this Speed Ball Platform Swivels Review, we are comparing the 2 swivels currently available in our range. In the Punch Equipment style of swivels, we have a poly-carbonated choice (poly speed swivel) or a stainless steel machined ball bearing swivel. Now, we’ll run through why you would buy either swivel. First of all, the steel ball bearing swivel is dearer compared to the poly speed swivel version. So the poly speed swivel is injected moulded and tends to be a lot quicker to assemble. The steel version is made with the same cutting machines that are used for creating dental/surgery equipment, so it takes a fair bit of work to create. 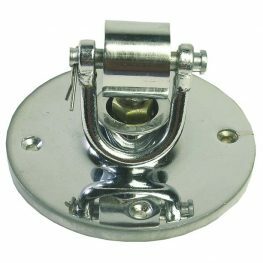 In the end, the steel ball bearing swivel is higher quality and offers a bit more value. As this swivel is higher, it allows the ball to travel in different directions and that makes this swivel harder to use. The ball is more unpredictable as a result. This swivel can also rotate 360 degrees and that requires another level of skill for the Boxer to use this well. You will see this steel swivel in professional gym setups. As opposed to the poly swivel, this one just flips backwards and forwards. It can rotate but it tends to be more straight up and down movement. So it’s a lot more predictable and it’s easier to use. Read the Ultimate Guide: Best Punch Boxing Gloves.